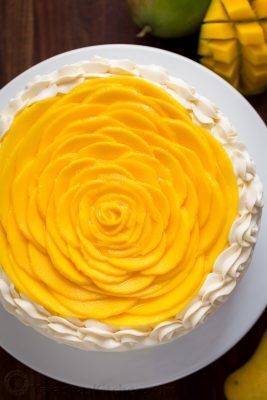 This mango cake is bursting with fresh mango flavor. It is layer after layer of mangos and cream. It doesn't get any better than this and the entire cake only has 9 ingredients! Prep: Pre-heat oven to 350˚F. Line the bottoms of two 9" cake pans with parchment (do not grease). In a separate bowl, whisk together 1 cup flour and 1/2 tsp baking powder. Sift flour into batter 1/3 at a time, folding between each addition, just until no flour streaks remain. Scrape from the bottom to catch any hidden flour pockets. Divide evenly between prepared cake pans and bake at 350˚F for 23-28 min (my oven takes 25 min). Tops should be golden brown and spring back when poked lightly. Run a knife or thin spatula around edges to loosen and invert onto wire rack. Peel back parchment paper right away and let cakes cool right-side-up to room temp before cutting them in half. In the bowl of a stand mixer fitted with whisk attachment, combine 16 oz cream cheese, 1 cup butter, 2 1/2 cups powdered sugar and 2 tsp vanilla. Beat on low to combine then increase to high and beat 5-6 mins, scraping down the bowl as needed. Frosting should be whipped, soft and spreadable. Transfer 1 cup frosting to piping bag fitted with large open star tip and refrigerate until ready to use for the topping. A mango has one long, flat seed in the center of the fruit that goes from stem to nose. Slice off the sides around the seeds of all 4 whole mangos resulting in 8 halves. Set aside 4 halves - you will need them to decorate the top. Dice remaining 4 halves and scoop them out of their skin then transfer these to a blender and process until puréed. Taste the mango purée and add sugar to taste if needed. Place the first sliced cake layer on a platter and spread with 1/2 cup mango purée. On the second cake layer, spread 1/2 cup frosting and place it frosting-side-down on the first layer so the cream and mango are hugging. Repeat with remaining layers then cover top and sides with remaining frosting. Pipe reserved frosting around the top border of your cake. Peel and thinly slice 4 reserved mango halves, cutting some strips long way and some wide. Layer mango slices in rings around the cake, starting with the longest pieces and overlapping each piece slightly until only a 1/2" space is left in the center. Roll a long thin strip of mango into a coil and place it in the center. Cake can be served right away or refrigerated 2 hours for easier slicing. It keeps well covered and refrigerated up to 3 days.